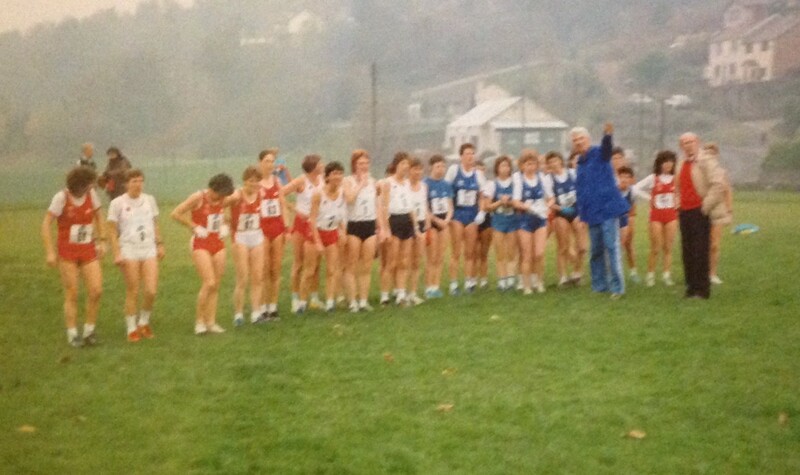 The first ‘International Veterans Cross Country Match’ took place on the 5th of November, 1988, at Moss Valley, Wales. L to R back row: Tony McCall, Colin Martin, Allan Adams, Henry Morrison, Sam Graves, Ian Leggett, Bernie McMonagle, Pat Keenan, Jack Maitland, not sure. Front: Archie Duncan, Ian Seggie, Willie Day, Bobby Young, not sure, Mel Edwards, Jim Morrison. Bobby Young wrote: “This was conveniently the day after my 45th birthday. Henry Morrison invited me to join a Scottish team to take on the English and Welsh. Delighted to do so, Pete Cartwright, John Maitland and myself drove down to Chester to stay overnight. We were supplied by SVHC with £10 each for petrol money. Next morning we drove to a school in Wrexham over the Welsh border and prepared to take on our rivals. We paid to wear a special, beautifully-embroidered, blue Scottish vest with a triangular badge. The course was two 5k circuits of a steep Welsh Valley. The climb was steep and long, with many being happy to say they only walked part of it with hands on knees. We then enjoyed a cup of tea and a biscuit in the local school. (In more recent years, this level of refreshment has been replaced by a banquet!) This was followed by the presentations. Luckily for me I was in a good vein of form and managed M45 Bronze. Then we drove home. Left to right. Nancy McKinnon, Moira Bonner, Kay Dodson, me in front, Trisha Calder hiding behind me, Margaret Robertson, Susan Belford, and Sue Rodgers. In the Women’s races, England won the W35 age group, with Scotland second. England also won W40, with Scotland third. Tricia Calder was First Scot in second place, behind Bronwen Cardy-Wise of Wales, with Janette Stevenson fifth. The Scottish W35 team were second. Wales triumphed in the Men’s race (Tony Simmons first, Alun Roper second, Taff Davies M50) third and Dic Evans fourth. First Scot was Allan Adams in seventh. Others in the Scottish team were: Ian Seggie, Archie Duncan, Willie Day, Bobby Young, Mel Edwards, Bernie McMonagle, Tony McCall, Ian Leggett, Jack Maitland, Jim Morrison and Henry Morrison. Wales won M40 and M50 team awards and England M45. Scotland was third in each category. A report of this event was as follows. 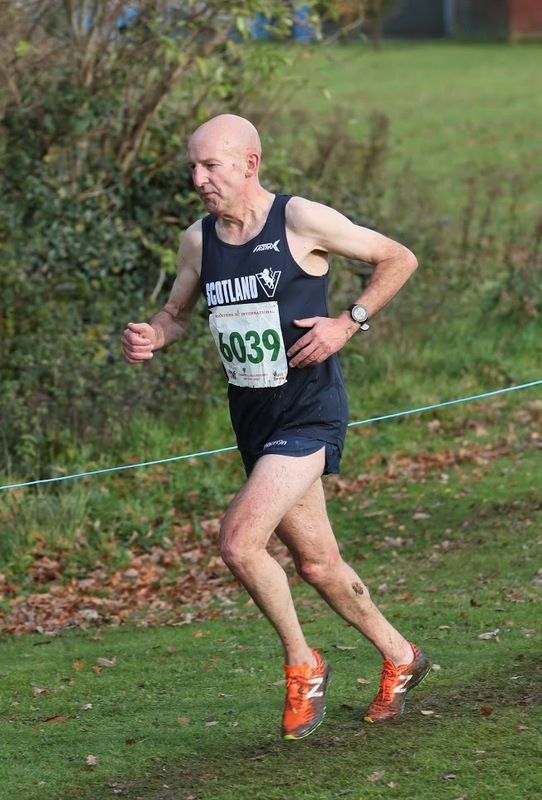 “A Scottish Veteran Harriers Club team was among the medals in yesterday’s veteran home countries cross-country match over a fast, grassland course at Ampthill Park, Bedfordshire. 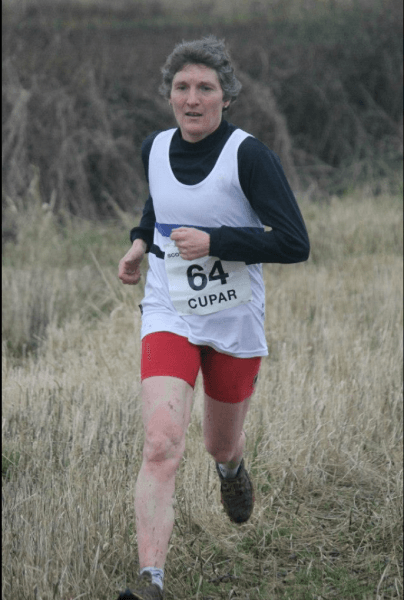 Tricia Calder, a farmer’s wife from Duns, finished second in the women’s race behind English internationalist Glynnis Penny. Calder, world hill-racing team bronze medallist, led the Scots (15 points) to second in the team contest behind England (8 points). Janette Stevenson (Falkirk Victoria Harriers) finished third overall in the over-40s race, with the Scots (26) again second to England (11). The W50 team won silver too. 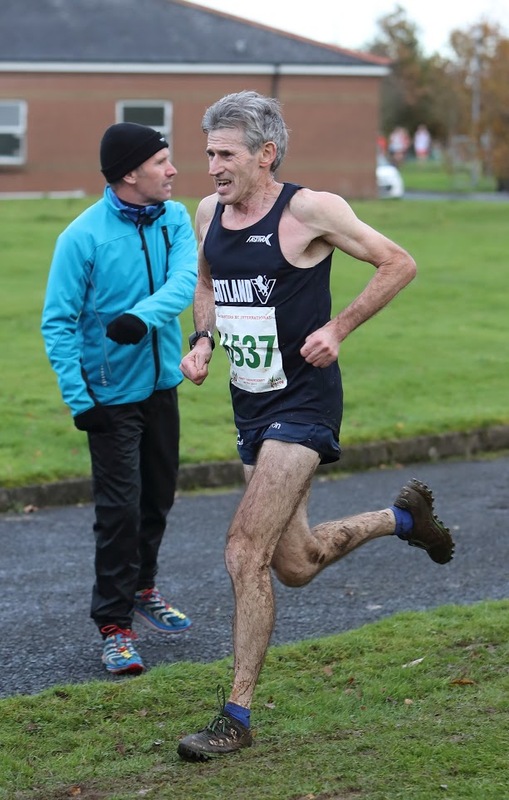 Scottish veteran marathon champion Allan Adams (Dumbarton AAC) was third in the 45-49 age group race, with the Scottish team second to England. In a high-class over-40 event, Colin Youngson (Aberdeen AAC) was seventh in 34.54. This race was won by former European 10,000m silver medallist Tony Simmons (Wales) in 33.45. Wales scored a surprise team victory over England, with Scotland a disappointing fourth behind Northern Ireland.” The M60 team was second. Other details were as follows. The silver medal winning W35 team was; Tricia Calder, Heather Wisely and Renee Murray. In W40, Janette Stevenson was backed up by Sue Rodger and Margaret Robertson, to secure second team. The Scottish W50 team won silver as well. The M40 team was in theory led by Colin Youngson and Ron Smith, but actually non-counter George Meredith (a tough guy who was to win the 1990 Scottish Veterans XC title) was first Scot, since he coped better with hills. Allan Adams was third M45, with Terry Dolan, Bobby Young and Mel Edwards ensuring second in the team contest. The M60 crew: Lawson, Gillespie and Livingstone, was second to England. 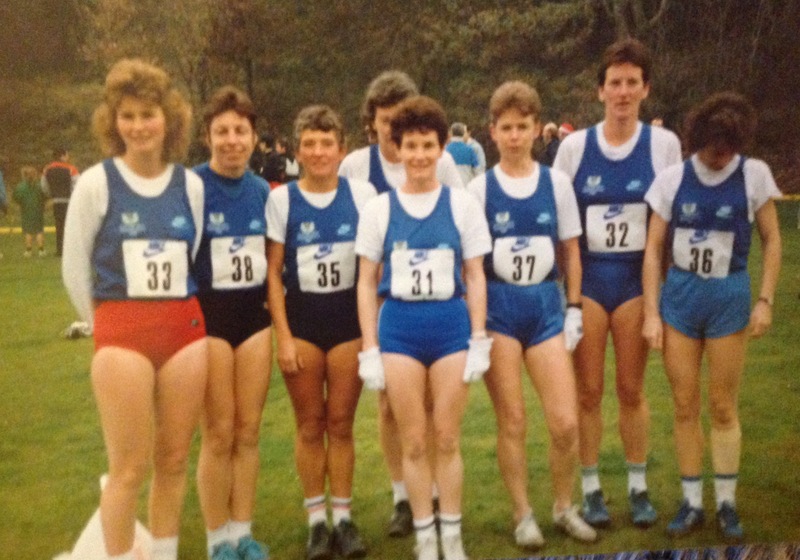 1991: Aberdeen, Balgownie Playing Fields.The event was run on 3rd November, over a smooth, grassy, undulating course. A committee, led by Mel Edwards, secured funding from Hydrasun. Consequently, free Scottish vests were given to Scottish runners; and two formal meals were supplied, the night before Sunday’s race; and afterwards, when prizes were presented. The four nations were allowed to run not only A but B teams. This experiment was never repeated. England’s Sally Young was first woman home and the W35 gold medallist. Christine Price finished first Scot and was second W35. She had support from Janet McColl (5th W35) and Rose McAleese (11th W35), so that the Scottish team finished second to England. There was a very tight finish in the W40 race, with Janette Stevenson 3rd (W40 silver) only four seconds behind the victor, Pat Gallagher of England. The Scottish W35 team won silver. Roy Bailey (England B) achieved a surprise victory over his own A team; and prevented runner-up Tony Simmons from winning for a fourth successive time. Brian Emmerson (Teviotdale H) was first Scot in 5th, with his team-mate Ian Elliot 8th. Scotland A finished third, behind the two English outfits. 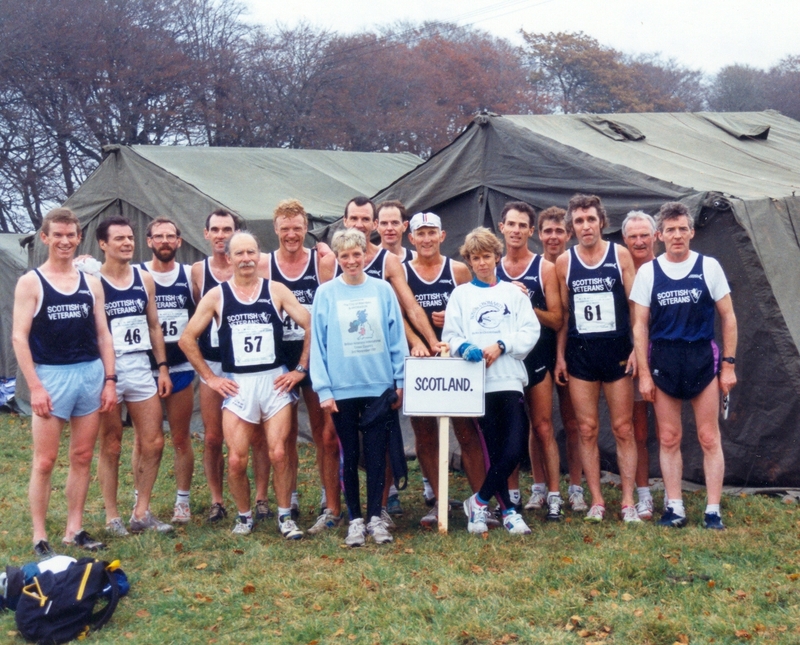 The Scottish M60 team was second, led by frequent World Veterans champion Bill Stoddart (individual silver). 1992: the event took place in Northern Ireland for the first time, at the Valley Leisure Centre, Newtownabbey, County Antrim, outside Belfast, on 31st October. The Republic of Ireland ran as Guests, which was to cause controversy later, when M45 team positions were calculated! A report in ‘Athletics Weekly’ stated that “143 men and 58 women faced a challenging course, consisting of a number of small hills and several soft muddy areas caused by recent heavy rain.” During the races, cold winds blew and more rain fell. England’s Ann Turrington won the women’s race. Sandra Branney was first Scot in fifth, and with Janet McColl 8th and Rose McAleese 9th, the Scottish W35 team won silver medals. Bob Treadwell (England) defeated Tony Simmons (Wales). 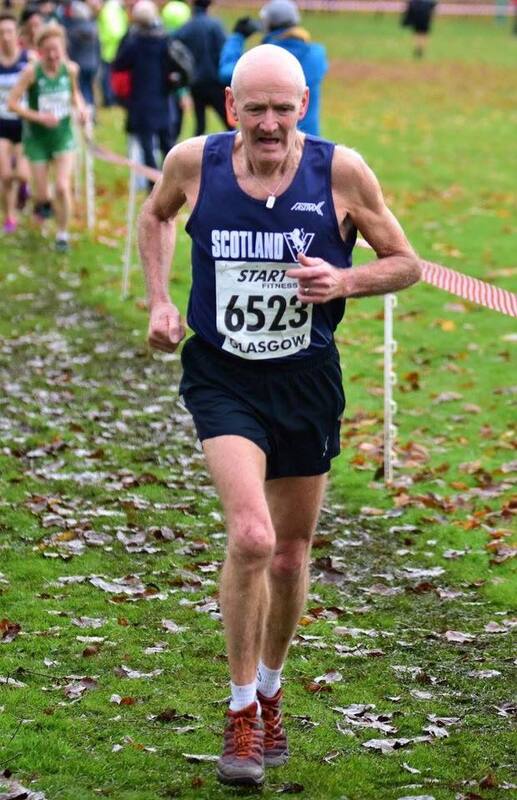 The first Scot to win an age group in this prestigious fixture, former Scottish marathon champion Colin Youngson (Aberdeen AAC), had his best-ever run as a veteran to finish sixth overall and first M45 (by 63 seconds). Cameron Spence (M40) was ninth and Archie Jenkins 11th so that, along with George Meredith and Brian Howie, the team won M40 team silver. The Scottish M45 team (Youngson, Terry Dolan, Colin Martin and Bill Adams) won gold by one point, from Wales and England. The event organiser, Jim Harris, was very happy to hand the medals over to fellow Celts. However the excitable English team manager, distraught that England had only won all six of the other age-groups, asserted repeatedly that, if Eire had been taken out of the results, then England would have won by a single point! Nevertheless, the four Scots still possess those treasured medals. Colin Y and Archie J celebrated with Guinness in a famous Victorian gin palace: the Crown Liquor Saloon, Belfast. That weekend, opportunist Colin also sold 80 copies of his book “Running Shorts”. Archie Jenkins wrote: “I have been involved in this wonderful event since 1992, twenty-one times as a competitor, and on the other occasions as a reserve – and once as the announcer. Not only is it special competitively, involving quality fields, but also socially, involving team camaraderie, and annually meeting up with friends, old and new, from each of the five competing countries. Sadly, in the case of English runners Jimmy Bell and Ken Moss, with whom I had many a battle in my age group, they are no longer with us. Socially, memories spring to mind of: Andy McLinden`s hangovers; acting as translator to the English for the legend Bobby Young; and having to follow, okay voluntarily, Colin Youngson on his post-race real ale pub crawls (although Doug Cowie may be less happy about those memories). Over the years it has been great to see Scotland team stalwarts such as Ian Stewart, Brian Gardner, Andy McLinden, Pete Cartwright and Jane Waterhouse (apologies to the others not mentioned) who all persevered over the years to eventually and regularly pick up individual medals. On the ladies` side, Hazel Bradley for one always makes herself available for selection. I also appreciate the hard work of team managers, initially Danny Wilmoth, then Davie Fairweather. 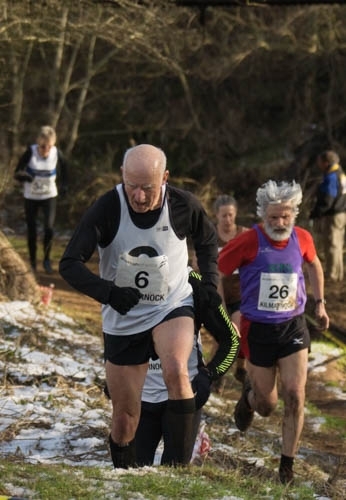 Personally, with the M65 age group looming in the not too distant future, it would be great to continue the feat of competing in every age group from M35 up. Admittedly the M35 was a fluke in Dublin 2010, stepping in as a spare reserve! Physically, however, this is going to take a lot of effort, including a loss of old age weight. “My honest opinion is that I enjoyed my earlier ones the best. Most of us travelled by coach, which I felt made for a better team spirit – apart from my first selection in 1993. The bus travelled all the way to Cardiff, arriving at 9pm. 30 minutes after the end of the race (and a visit to the supermarket for 4 cans of Murphy’s stout) we were on our way home, to arrive back in Glasgow at 1.30am! All the way, there and back, I really felt like an outsider! The only people I remember giving me the time of day were Andy McLinden and his Hamilton team mate Hughie Gibson. In 1994 we travelled to Sunderland by bus, but I felt better, since I had George Sim and Graham Milne for company. In 1995 we were off to Dublin in a bus that we had to push-start every time. We even had to push it off the boat. It was a thrill that year to meet (and beat) Tony Simmons. George, Graham and I gave the night ‘do’ a miss, opting to go into town! The taxi driver who took us in said he would pick us up at 11pm, at the same place he dropped us off – and he was as good as his word. On our return to our hotel in Malahide we were invited to join the Irish Cycling function which was taking place. George’s wife’s cousin Alistair McClennan was head coach!!! Joe Dolan was performing, which was a great end to the day. For me Wales, England and Ireland was repeated in each age group – I never ran in Scotland or N Ireland, since they were at the wrong end of age group for me. I particularly enjoyed the two or three hours after the race in the company of Colin Y, Archie J and Ian Stewart, either watching a 5/6 Nations rugby match or sussing out a new ale! We should be ever indebted to Lynn Marr for her taxi duties. Ian Leggett wrote: “After the demise of the prestigious Edinburgh to Glasgow Road Relays this annual event in November is a must goal for us old codgers. The fixture is circulated around each different participating country and this year it will be organised in Scotland. My first introduction was in 1988 with only three home countries taking place; now, with the two Irish countries added, it has become more International. I’ve been fortunate enough to formulate life-long friendships from this event, as normally the circulation of personnel through the age groups has been constant, with the exception of the English teams who, with their greater depth in numbers, seem to be able to change their line-up regularly. The Scottish team’s kit always seemed to be inferior to that of the other nations, maybe because of the 50 shades of Blue, which is dark compared to the bright Green of the Irish, the radiant Red of Welsh and the White of England ( who by the way receive sponsorship from Sport England). It doesn’t mean that the Scottish teams haven’t performed well, because we have had some very notable victories in the past and will have in the future. I would like to remark on two memorable events that have stuck for ever in my memory and both, coincidentally, were in Ireland. The first event was in NAVAN in Southern Ireland, in 2000. We had a long trip by bus and arrived in the middle of a rain storm at 10 o’clock at night. The bus stopped in the dark outside this ivy-covered Country Manor stuck in the middle of nowhere. The arched wooden entrance door looked as if was out of the Rocky Horror Show or the Addams Family and, with the torrential rain belting down, all that was missing was the forked lightning as the door creaked open and we were ushered into the main reception area. This was an old fashioned library of old dark oak shelves up to the ceiling. The lighting was pretty dim and the heating consisted of a one-bar electric fire. Our beds were in dormitory style, as this used to be a Convent at one time. It was certainly very Spartan but we managed to put out a sterling performance in the race. The second experience I want to relate to was in NEWTONABBEY just outside Belfast in 1992. It was during the times of the unrest In Ireland and the security forces were still operational in Northern Ireland. Our accommodation was in the centre of Belfast, in the Europa Hotel and, as we slept in our rooms, suddenly in the middle of the night we had a helicopter with searchlights scanning our hotel and, as the bright lights swept across our window, we wondered what was coming next. Thankfully it passed on. In the morning we had a warm-up run planned and, while running through the streets of Belfast at that time in the early morning we encountered British soldiers crouching in doorways, with their guns at the ready, and also on side streets complete with combat gear. Black cabs were everywhere: they were the only way to get around as no buses were allowed into the centre of town. We encountered the barricades and every store had its own security guards prominent outside its doors. The races themselves were all well organised and the Northern Ireland contingent were full of the best Irish hospitality. I returned home with admiration for their bravery and fortitude in face of the situation they were in. 1993: The course was outside Cardiff in Lord Trehearne’s Estate, on dry grass and featured a short but very stiff hill. 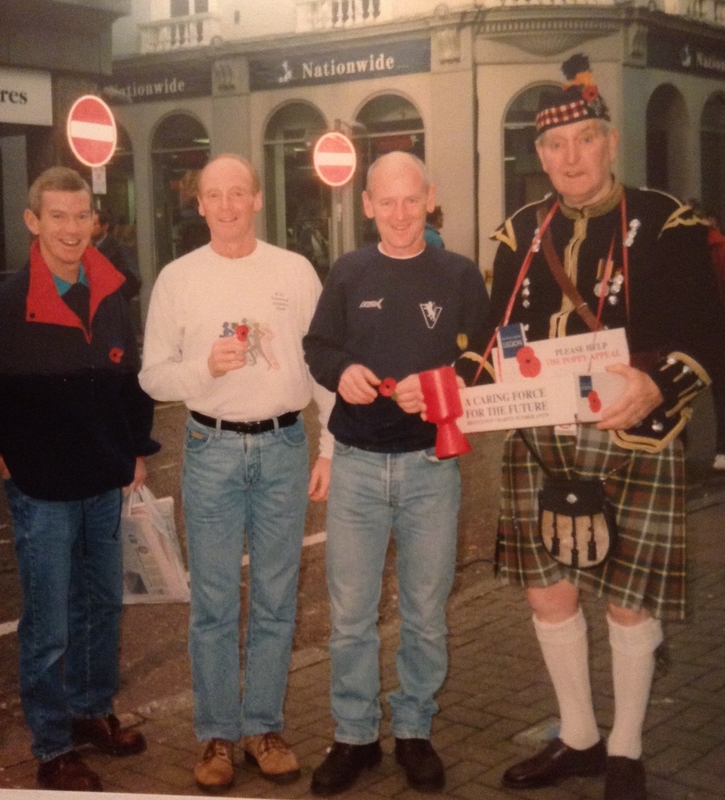 Archie Jenkins remembers the ‘Saga bus trip on the way down from Glasgow’, with older team members requiring relief at every service station. Doug Cowie, Andy McLinden, Gerry Fairley, Ian Seggie, Bob Young, Steve Dempsey, Christine Price, Archie Jenkins, George Meredith, Allan Adams, Margaret Robertson, Ian Donnelly, Ron Smith, Bob Guthrie, Brian Campbell, Andy Stirling. 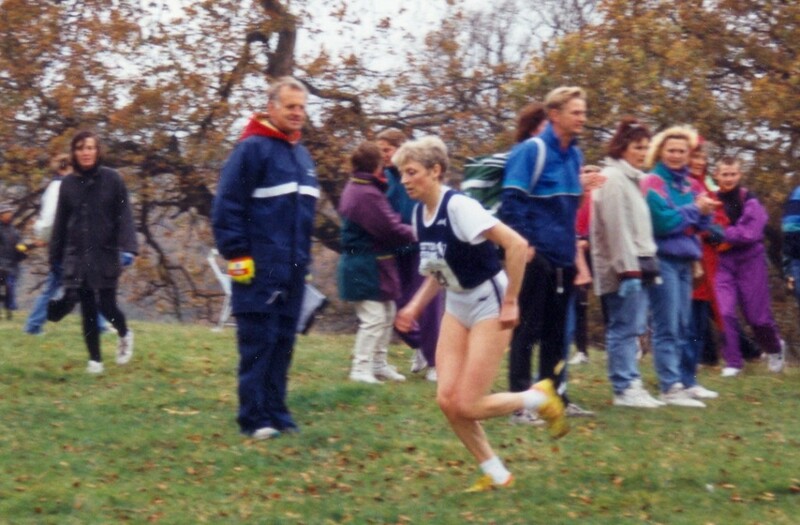 The top Scottish performance was by Christine Price (formerly Chris Haskett, of the famous Dundee running family). 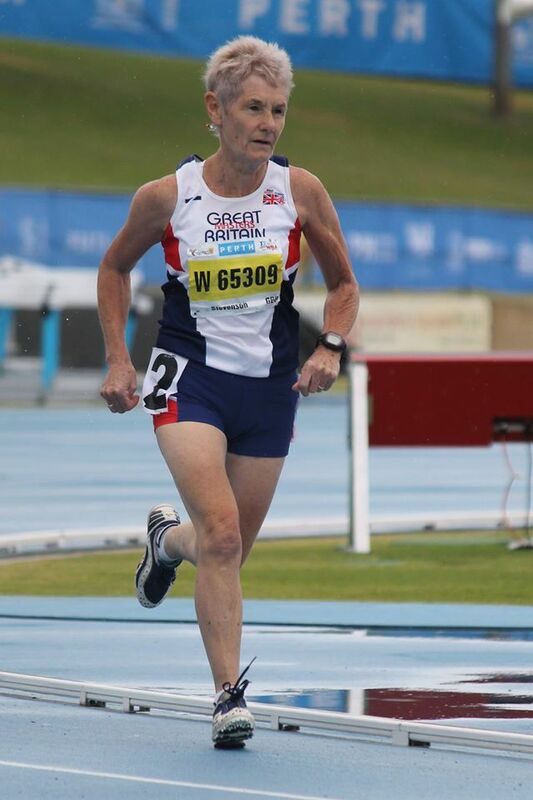 This experienced international athlete won the W40 title. (She first represented Scotland, aged 17, at the 1970 Commonwealth Games in Edinburgh.) 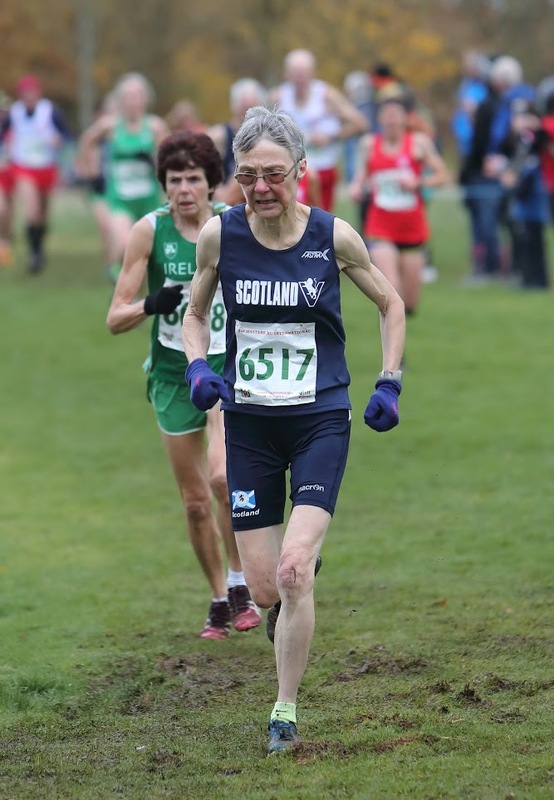 All of the Scottish women had good runs, with very close packing, and special mention should go to: Janet McColl (3rd W35), Sue Roger (2nd W50), Margaret Robertson (11th W40), Rose McAleese (9th W35), Ann Nally (6th W50) and Irene Gibson (8th W50). (Irene’s father was the great John Suttie Smith). The W50 team won silver medals. In the men’s race, Gerry Fairley started fast but eventually Archie Jenkins came past to finish first Scot (8th M40) with Gerry 11th. Ian Seggie was 13th M45; Bob Guthrie and Bobby Young 7th and 9th M50; and Hugh Gibson, Willie Marshall and Pat Keenan 5th, 6th and 8th in the M60 race – finishing second team. 1994: Silksworth, Sunderland. The course was very muddy. Since the Scottish team arrived shortly before the start, the women had to change on the bus. Janette Stevenson was 2nd W40. With Sandra Branney third and Rose McAleese fifth, the Scottish W40 team won gold medals. Jackie Byng was 3rd W50 and her team (Mary Chambers and Ann Nally) won silver. The Men did less well on this occasion. Archie Jenkins was first Scot (tenth M40). Allan Adams was ninth M50, with Bobby Young tenth and Bernie McMonagle 11th. In the M60s, Hugh Gibson was fifth and Stuart Lawson tenth. On race day the weather was cool and the course flat, firm and fast. In the Open Race, Team Manager David Fairweather was first M50 and Tom O’Reilly first M60. In the Women’s Race, Maggie Sinclair was 8th W40, Kate Todd 8th W45 and Jackie Byng 4th W50. The Men’s Race featured a contest between Eire’s Gerry Kiernan and England’s Nigel Gates, which the latter won clearly. First Scot home was Charlie McDougall (3rd M45); closely followed by George Sim (5th M45); then Jim Robertson (16th M40); and Archie Jenkins (18th M40). Next was Archie Duncan, who ran a stormer to finish 2nd M50, ahead of such notable M45 runners as Harry Matthews and Tony Simmons. Bobby Young was 6th M50. A battle went on, between Peter McGregor (M45), George Black (M55) and Hugh Rankin (M60). George came through to win that little contest and secure M55 silver; Hugh did even better to win the M60 race. He was supported by Jim Irvine (6th) and Henry Morrison (7th) to win M60 team gold, beating England on count-back. Archie Jenkins recalls that it was a lovely day and, afterwards, the Guinness was very refreshing. An excellent dinner dance was the first evening function since Aberdeen. In the Men’s race, Gerry Gaffney was first Scot (6th M40). He was backed by Keith Varney, Archie Jenkins and Brian Gardner, to win team silver. Colin Youngson finished 5th M45, but was slower than the superb Dougie Gemmell (third Scot home and M50 individual silver medallist). George Black did very well to be third M55. Hugh Rankin won M60 silver, and his team (John Gormley and Henry Morrison) also finished second. 1997: Ballymena, Sentry Park. The night before the races, the hotel dance went on until one a.m. and then drunks bellowed in the car park. It was important not to be upset by lack of sleep. There was a one-mile loop to be circled, undulating and rather muddy on bends. 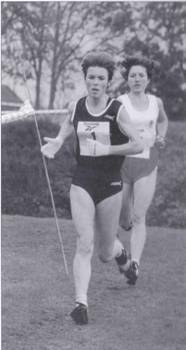 Trudi Thompson, GB ultra-marathon runner, was first Scottish woman, in a fine second place overall. Jackie Byng ran well to be 6th W50. In the Men’s race, teams from the five countries lined up in pens, waiting for a countdown to the start. The hooter caught everyone by surprise. Everyone rushed downhill to the first sharp right-hand corner. Some idiot running in bare feet skidded straight on and was never seen again! Athletes charged on recklessly, as the course twisted and turned, rose and fell. The big hill felt harder on the second lap – and for the men there were five to get round. Keith Varney was first Scot; Archie Jenkins 3rd M45; and Colin Youngson third M50 with his team (including Bobby Young, Dougie Gemmell and Davie Fairweather) winning silver medals. The banquet was very good, followed by a demo of Irish dancing and lots of Guinness. The legendary 1972 Olympic Pentathlon champion, Mary Peters, handed out the prizes. Trudi Thompson, so consistent, gained W40 silver and her team (Trudi, Lynn Harding 7th, Sonia Armitage 8th and Anne-Marie Hughes 17th) finished first. Bobby Young was an excellent second in the M55 race; and Archie Jenkins won M45 bronze again, leading his team (John Hanratty 11th, Andy McLinden 12th and Barney Gough 13th) to silver medals. In the M40s, Keith Varney was 9th, Gerry Gaffney 10th, Brian Gardner 11th and Ian Stewart 13th. George Meredith was first M50 Scot in 8th place. Bert McFall was 9th M60. 1999: Bideford, England. 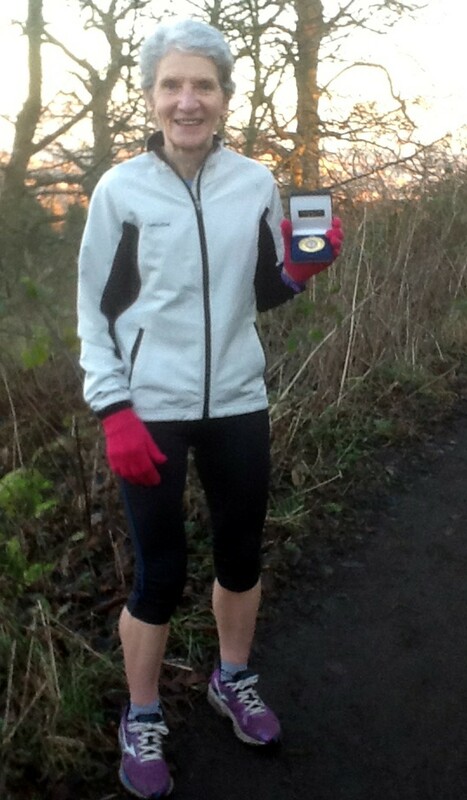 GB international marathon runner Trudi Thompson won the W40 title in fine style, by 34 seconds. Elaine McBrinn was 8th W35; Patricia Affleck 9th W40; and Jane Waterhouse 10th W45. The Scots also had an individual gold medallist: hill-runner extraordinaire Colin Donnelly (M40), who led his team (Keith Varney 4th, Gerry Gaffney 9th, Dave Dymond 14th, Brian Gardner 15th and Ian Stewart 17th) to silver medals. For the second time in succession, Bobby Young won individual M55 silver; and his team (Davie Fairweather 7th, Pete Cartwright 8th and Brian Campbell 9th) was second. Ian Leggett finished 9th M60. The Scottish M65 team (Bert McFall 4th, Hugh Gibson 6th, Tom O’Reilly 8th and Henry Morrison 9th) also won silver. 2000: Navan, Eire, Dalgan Park. 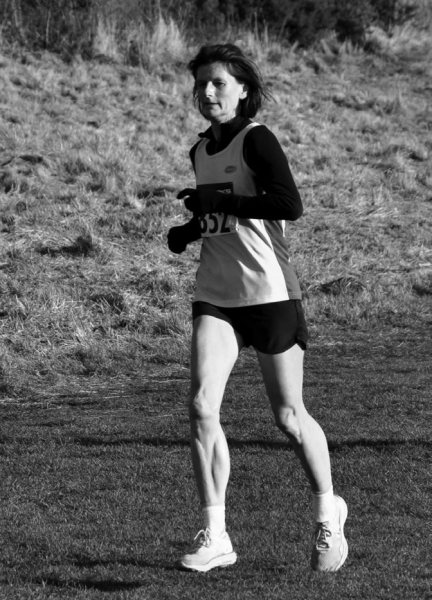 Despite the course being tough, with glue-like mud, World W50 10,000m record-holder (and also 1999 World Masters 5000m and 10,000m champion) Janette Stevenson ran away with the W50 title. Her W50 team won silver. Jackie Byng was 3rd W55. Sue Ridley did well to finish third W35. The M50 team [George Sim (individual silver), Charlie McDougall, George Meredith and Colin Youngson] finished a very close second; as did the M65 outfit (Bert McFall, Jim Irvine and Henry Morrison). David Fairweather reported: “In the Ladies’ race, Anne Keenan-Buckley (Eire), for the 3rd year in a row, completely dominated the race from the off. She appeared to just float over the ground to win by over 1½ minutes in a 16 minute race. Tricia Affleck ran the race of her life to finish 3rd overall and 2nd W40. Just like me last year, she had no idea she was so far up and couldn’t believe she’d won silver. Trudi Thomson (6th W40) showed that she is only human and can no longer head the field just 2 weeks after running the Dublin marathon (well she is training for the Commonwealth Games Marathon after all). She had to pull out all the stops to hold off the determined onslaught of Janette Stevenson, who repeated last year’s W50 gold medal performance, and Susan Finch who was 5th placed W35. Addi Gerard finished 7th W40 to secure team silver. Sue Ridley was 8th W35. Colin Donnelly started very cautiously and had to work his way up from the low 50’s to a final sprint for 3rd M40. All the Scotland M40s (Murray, Donnelly, Ross Arbuckle, Colin Meek, Dave Dymond and Ian Stewart) had excellent runs, but the tight packing of England in 2, 4, 5 and 6 was too much to beat and we had to settle for silver. George Sim (4th M50) failed narrowly to win a medal this year, but with Andy McLinden 9th, Brian Emmerson 13th and Charles Noble 16th they won team silver. In the M60s, Ian Leggett pulled through to 5th, George Black finished 7th and, with support from last-minute replacement and team newcomer Robert Daly, they won team silver. The M65s were led by Bert McFall in 7th. 2002: Ballymena, Sentry Park again. The same hilly, muddy loop had to be negotiated several times. In the women’s race, Sonia Armitage was top Scot (4th W40), just in front of Elaine McBrinn (6th W35) and Frances Florence (5th W40). Hazel Bradley finished 5th W50. In Tommy Murray’s absence, Julian Critchlow won the 40-49 race, with Colin Donnelly first Scot (fifth M40). The Scottish M45 team (Mike Simpson, Ian Stewart, Gerry Gaffney and Dave Dymond) secured silver medals. George Sim ran his usual fast race to be third in the M50 category, and was well-supported by Andy McLinden and Archie Jenkins in fifth and sixth. Fred Connor was fourth counter and the M50 team finished second. Colin Youngson managed 3rd M55, just in front of Bobby Young (4th). Terry Dolan was third counter and that team too won silver. Ian Leggett ran well to finish fifth M60. 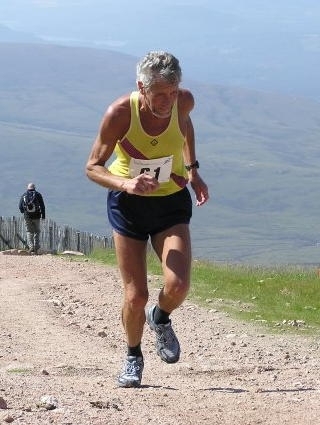 Hugh Gibson produced the best individual performance by a Scottish man, with second place in the M70 age group. Bill McBrinn was 6th. 2003: Cardiff, Bute Park. “Race day was cold and grey; and the course flat, twisting grass. In the Women’s race, Eileen Lang ran boldly and hung on bravely to finish 4th overall and win a bronze W35 medal. Sue Ridley and Suzanne Carson contributed to an excellent team silver. Susan Finch was 5th W40; and Jane Waterhouse 5th W50. Bobby Young (M60) moved through strongly mid-race to secure an individual bronze medal. Unfortunately even very good team packing by Pete Cartwright (5th) and Brian Campbell (6th) led to a heartbreaking one-point defeat by the inevitable English. Hugh Gibson (M70) maintained his excellent record with a fine silver medal. 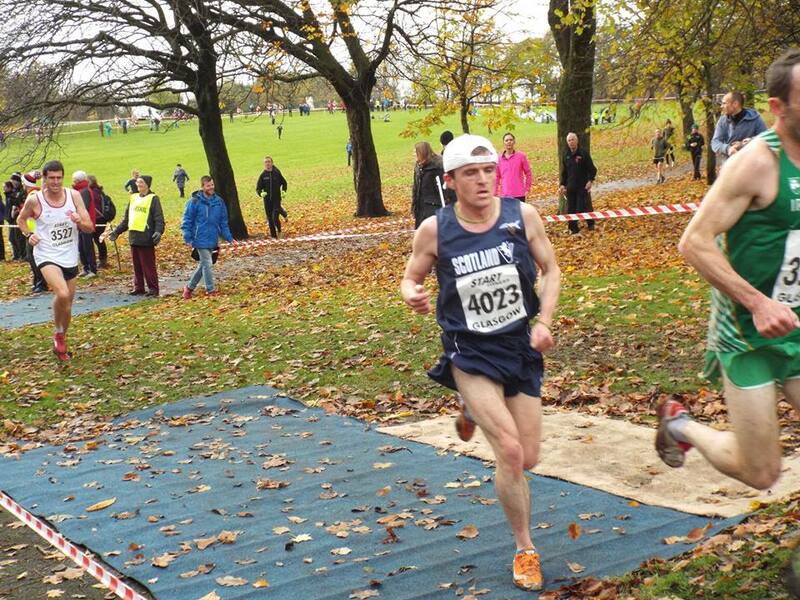 He and his team-mates Tom O’Reilly (8th) and Willie Hamill (10th) clinched second place too. 2004: Croydon, Lloyd Park. “After an arduous 400 miles bus journey from Glasgow, we reached the hotel in Croydon about 8:30, it was a relief to find that Ann Nally had volunteered to distribute numbers and provide assistance to the team. Saturday morning dawned cold and grey, but it didn’t look too bad as Ann guided us through Croydon on a walk/jog to Lloyd Park. However, just as we reached the park we saw the odd flake of snow, and the weather went downhill from there. The course consisted of 1 small loop, followed by a 3km loop that went out to the extremity of the park, so it wasn’t good for spectating. M40-69 ran 2 full 4km laps, while the women and M70+ ran a figure of 8, before disappearing onto the large loop to make up 6km. 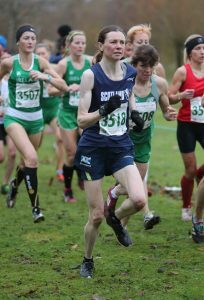 Ann Keenan-Buckley wasn’t running this year, but fellow Irish International Niamh O’Sullivan proved an able successor. Mountain runner Sonia Armitage led the field up the first hill and round the starting loop, with Niamh in close attendance. BMAF and SAL W35 cross country champion Sue Ridley was not far behind, followed by W45 Tricia Affleck, W35 Janet Laing and SAL W40 cc champion Hazel Dean. The M70s were led through by Brian Ashwell (Eng), but Walter McCaskey came through in 2nd followed by Bert McFall, with Tom O’Reilly and Hugh Gibson not far behind. We then had to wait while the field negotiated the muddy, undulating large loop. Niamh O’Sullivan appeared with an 80m lead over Margaret Deasy (W40, Eng), closely followed by 1st W35 Sue Ridley. Hazel Dean was next Scot to finish 12th overall, followed by Sonia Armitage 14th and Tricia Affleck 22nd. 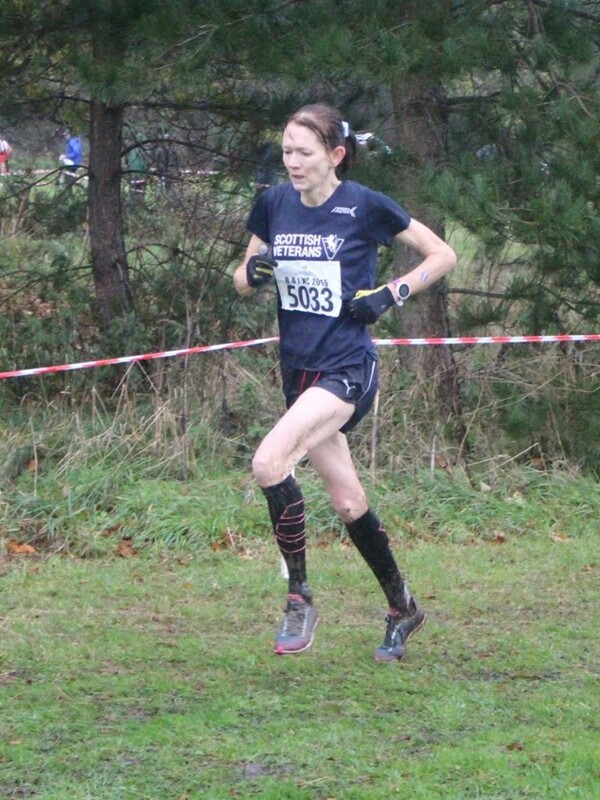 Jacqui Thomson, who is actually W40, ran superbly for the W35 team to finish 23rd overall. With good performances by all team members the women won silver medals for W50 (Jane Waterhouse, Hazel Bradley & Liz Bowers. In the M70s, positions were reversed at the finish with Bert 2nd and Walter 3rd. Tom finished 7th, closely followed by Hugh Gibson, to win team silver just 1 pt behind England. The next race was for M55 – 69. Unfortunately the M55 and M65 teams were not in medal contention, but Pete Cartwright (M60) kept close to the leading M60 England runners and managed to split them up to win bronze. Bobby Young, David Fairweather and Gibson Fleming followed in 5th, 7th and 9th places to win team silver. George Mitchell again led the M55 team home in 9thplace, while Steve Cromar was 7th in the M65 race. By the start of the M40 – 54 race the temperature was just above freezing, and the ground was badly churned up. Not many of us hung around to provide support, preferring to retreat to the changing rooms for a hot drink. Brian Gardner ran the race of his life to win M45 gold and finish 5th overall. Tom Anderson and Ian Stewart were neck and neck throughout the race, with Tom just sprinting clear at the finish in 8th place. John Simpson ran a spirited debut international race to finish 15th and help secure team silver. Steven McCloone was first Scot home in the M40 race in 15th place, and Andy McLinden, who flew down to Luton on Sat morning, was first Scot M50 in 8th place. Despite strong team support they weren’t in contention for team medals. The Dinner and Presentation, at the HSBC Sports & Social Club in New Beckenham, was rather disappointing. There was a free bus service, but the bus was due to return to our hotel before the end of the dance. We were so tightly packed in the hall that the staff had difficulty serving the meal and, despite an effort to shorten the medal presentation, the dance was just starting as our bus was ready to depart. 2005: Dublin, Santry Demesne. Report by Davie Fairweather. In the Women’s Race, first Scot home was Ann McPhail (12th overall and 5th W35), one second in front of Sue Ridley (6th W40). Janette Stevenson won the W55 event by 32 seconds, leading her team (Hazel Bradley 7th and Phyllis Lemoncello 11th) to team silver. Fiona Matheson was 8th W40 and Sonia Armitage 4th W45. The M55-M69 race was dominated by England’s Mike Hager, but he was bravely chased by George Sim, who won the M55 silver medal. Meanwhile Bobby Young was having the run of his life to win the M60 title by shaking off reluctant England runner Willie Allan, who is actually Scottish and used to run for Edinburgh University but lives in Tadcaster. Gibson Fleming was 7th M60 and Brian Campbell 12th. The M60 team only lost second place on countback. Ian Leggett had a fine run to finish 3rd M65 (Steve Cromar was 9th). Walter McCaskey came through to secure M70 silver, leading his team (Tom O’Reilly 5th, Bert McFall 6th and Willie Hamill 8th) to second place medals. The Scotland team for the M40-54 race was sadly depleted by injuries but Jack Brown finished 6th M40 and Andy Little 8th. Ian Stewart was first Scottish M45 in 10th; and Andy McLinden 9th M50. The superb Janette Stevenson retained the W55 title, no less than one minute 25 seconds in front of second place in this age group! Her team (Hazel Bradley 5th, Kate Todd 7th) won silver medals. 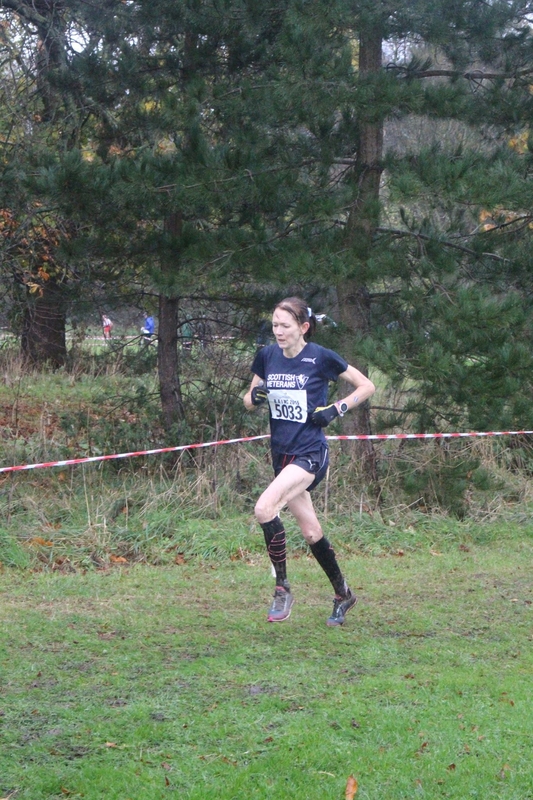 First Scot home was Fiona Matheson (8th overall and second W45). Susan Finch (4th W40) was two seconds behind her. Fiona’s W45 team (Sonia Armitage 5th and Pam McKay 11th) finished second. Janet Dunbar was 7th W35. In the M40-64 race, Andy Little finished 8th M40, with Jack Brown 9th. Neil Thin ran very well to end up 4th M45. Brian Gardner was 6th M50 and Alastair Dunlop 9th. George Mitchell (4th M60) led his team (Graham Smith 6th and Frank Yeoman 10th) to silver medals. However the Scottish male star was elegant George Sim who improved one place from the previous year to win the M55 title. Andy McLinden was 9th and Charlie Noble 10th. Ian Leggett was 8th M65. The M70 team (Walter McCaskey 5th, Les Nicol 6th and Alistair Shaw 8th) finished second behind England. 2007: Belfast, Stormont Estate. The course featured a narrow, muddy start, but then several laps of fine parkland, before a hill and a tricky, slippery finish. 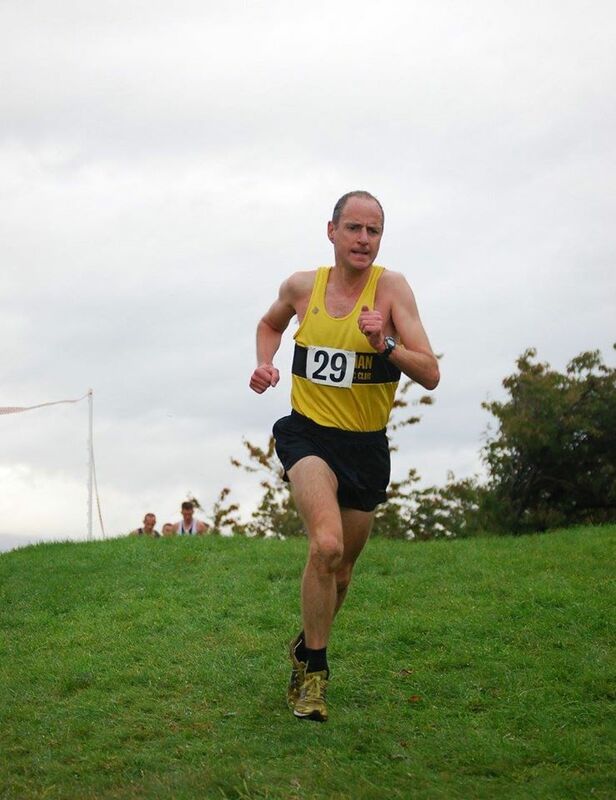 Bobby Quinn, a multi-Scottish champion, ran brilliantly to finish first in the 35-49 race and secure the M40 title. With support from Andy Little 6tg, Roger Alsop and James Snodgrass, Robert’s team won second team medals. Second Scot home was Neil Thin, who had a fine run to win M45 individual silver, with Ross Arbuckle 9th. In the M50-64 event, Ian Stewart raced very well to be second M50. 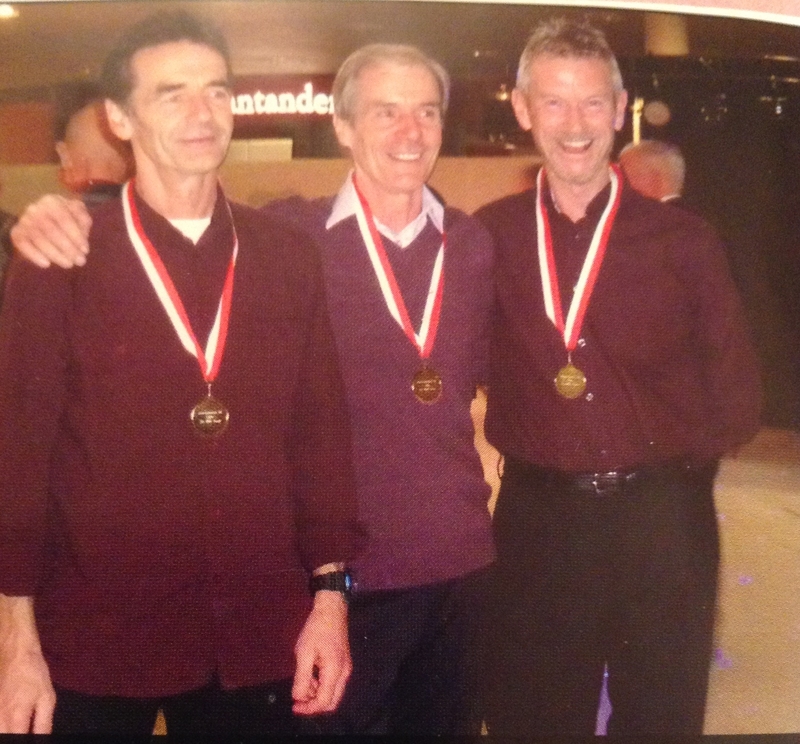 His team [Brian Gardner 3rd, Alastair Dunlop 8th and Colin Miller) won silver. The M55 Scots did even better by winning the team title [George Sim second (to Mike Hager of England), Andy McLinden third, plus Archie Jenkins 7th and Ewan Patterson 8th]. In the M60 age group, Scotland won team silver [Archie Duncan a splendid individual silver medal, and support from consistently strong George Mitchell (4th), Colin Youngson and Frank Yeoman]. It was second again for the M65 team (Pete Cartwright winning an excellent individual silver, with backing from Ian Leggett, Rab Daly and Steve Cromar). The M70s matched that team result, due to Les Nicol 4th, Alistair Shaw 6th and Walter McCaskey 7th. In the women’s race, W45s Susan Finch (6th) and Sonia Armitage (7th) were the first Scots home. Clare Gemmell (10th W35), Julia Henderson (12th W35) and Michelle Heatherington (6th W40) were the next Scottish finishers. Jane Waterhouse (7th W50) and Hazel Bradley (5th W55) also ran well. 2008: Swansea, Singleton Park. The first race was 6km for W35 – W65 plus M65 and M70. England’s Debby Walters W40 was 1st, followed by Ireland’s Donna Mahon W35. Megan Wright (3rd W35) was first Scot 7th overall, finishing just in front of Ireland’s Niamh O’Sullivan W45. Julia Henderson (10th W35), Sonia Armitage (5th W45) and Hazel Dean (7th W45) were the next Scottish finishers. Jane Waterhouse and Liz Bowers (4th & 5th W55) also ran well in their age-group, with Jane finishing 21 sec behind winner Zina Marchant. Hazel Bradley was 10th W55, which meant that the Scottish team won silver medals. On a severely undulating, damp, lap course, Walter McCaskey was 7th M70 and Alistair Shaw 8th. Brian Campbell (6th M65) assisted by Bobby Young (7th), Pete Cartwright (8th) and Ian Leggett (9th), secured team silver. Next race was 8km for M50 – M60. George Mitchell was 4th M60 and Archie Duncan 6th. George Sim (4th M55), Andy McLinden (6th), Ewan Patterson and Archie Jenkins finished second team. Brian Gardner finished 5th M50 and, with Iain Stewart (7th), Jeff Farquhar and Colin Miller, the team won silver. By the final international race for M35 – M45 conditions were more sticky and slippery, which made the race more interesting. The best performance on the day by a Scottish man was certainly produced by Bobby Quinn, who was second M40 behind England’s Tim Hartley. They both outpaced all the M35s. Lewis Lawson finished 9th M45. 2009: Birmingham, Perry Park. What would have been a flat, fast course was hit by a thunderstorm just before the start of the race, so that mud became a challenge, particularly on corners. 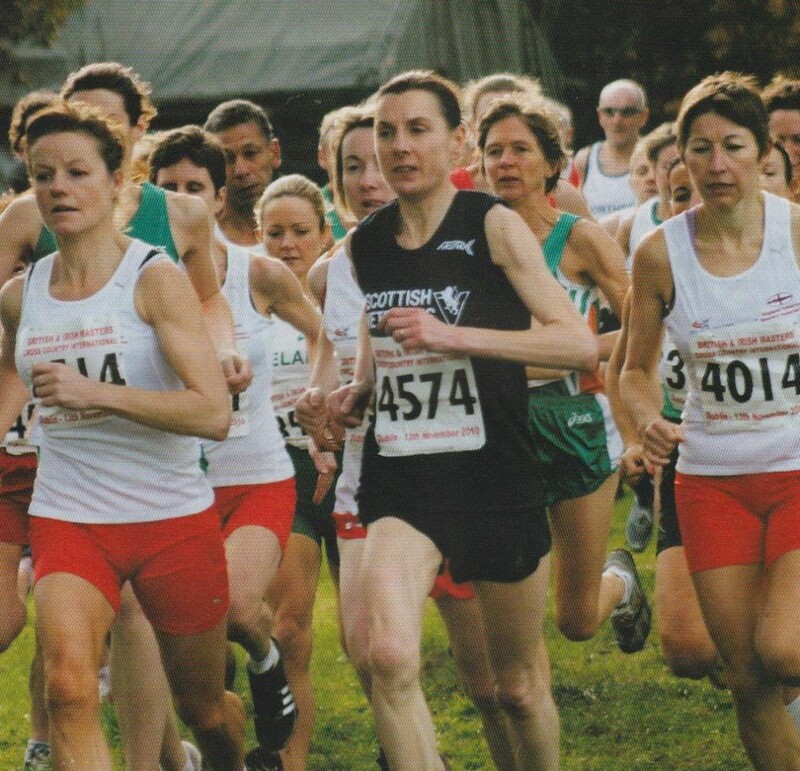 In the women’s race, Sue Ridley (10th W40) was first Scot home; Sonia Armitage was 9th W45; Phyllis Hands 10th W50. However the finest Scottish performance was achieved by ultra-consistent Jane Waterhouse, who fought off three English rivals to win the W60 title. Jane wrote later that, athletically, it was her finest hour! Liz Bowers and Liz McGarry helped her to secure team silver as well. Ian Leggett (4th M70), assisted by Les Nicol (6th) and Hugh Rankin (7th) made sure that the Scots finished second team. Davie Fairweather, Pete Cartwright and Bobby Young were 5th, 6th and 7th in the M65 contest, to win silver as well. George Mitchell was 5th M60; Andy McLinden 4th M55, with Doug Cowie 7th; and Jeff Farquhar ran especially well to win individual M50 silver, with Ian Stewart 8th. In the M35-49 race, first Scot was Neil Wilkinson (8th M40). Iain Campbell finished 7th M45. 2010: Dublin, Santry Demesne. On a deceptively tough, increasingly muddy lap course near the Billy Morton Stadium, Melissa Whyte was the Scottish star, with 3rd overall in the women’s race and 1st W45. Sue Ridley ran well to be 5th in that age group. The ultra-consistent Jane Waterhouse was 4th W55, with Liz Bowers 9th. Hazel Bradley ran her usual good race for 5th W60, with Kate Todd 7th. Steve Wylie did very well to finish 5th M35. Dave Gardiner excelled with 4th M40. Iain Campbell was 6th M50; Alastair Dunlop 8th M55; Robert Marshall 6th M60; Davie Fairweather 9th M65; and Walter McCaskey 7th M70. 2011: Glasgow, Bellahouston Park. Report by Davie Fairweather. The race was two weeks later than usual, on 26th November. The weather forecast was poor, but we didn’t get snow and ice, just rain and gales, which made the course very heavy, slippery and treacherous. Nevertheless the Scottish teams had some good results. 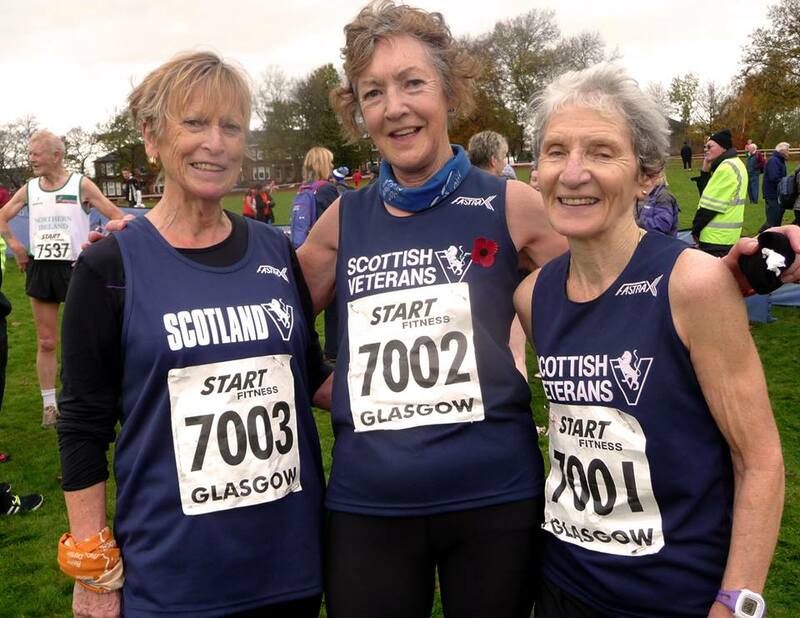 In the 6 km race for Women and Men aged 65 upwards, there was a tremendous battle between Lesley Chisholm W35, Melissa Whyte W45 and Fiona Matheson W50, who eventually finished 3rd, 4th and 5th overall respectively. Lesley was second W35 but Melissa Whyte and Fiona Matheson both won age-group titles. The W35 team (including Dianne Lauder 4th, Julia Henderson 7th and Paula Wilson) finished second, as did the W45 outfit (Sue Ridley 5th, Kirsty Husband 8th and Hilary McGrath 8th). Sheila Gollan was 6th W40; Jane Waterhouse 5th W55, with Erica Christie 9th and Phillis Hands 10th; and Kate Todd was 7th W60, with Beth McLafferty 10th. Betty Gilchrist (W65) ran extremely well to secure individual silver. Totally reliable George Mitchell finished third M65, and with backing from Stewart McCrae (8th), Pete Cartwright and Davie Fairweather, his team was second. Ian Leggett 6th, Watson Jones 8th and Walter McCaskey 11th did well in the M70 age group. In the M35-64 race, the M35 team (Jamie Reid an excellent 2nd, David Millar 4th, Robert Gilroy 7th and Joe McKnight 17th) finished second. Stuart Kerr was 7th M40; and Neil Thin won M50 individual bronze, with Iain Campbell 6th. The M55 team packed well (Brian Gardner 3rd, Paul Thompson 5th, Alastair Dunlop 6th and Alex Chisholm 8th) to make sure of silver medals. Andy McLinden ran very well to finish 2nd M60. 2012: Belfast, Queen’s University Playing Fields. Fiona Matheson gave a first class performance to retain her W50 title. Sue Ridley ran well, as usual, to achieve W45 individual bronze, as did Liz Bowers (W60). Joasia Zakrzewski was 7th W35; Jacqui Thomson 6th W45; Pamela McCrossan 8th W50; and Hazel Bradley 8th W60. Pete Cartwright excelled again to win M70 bronze. George Mitchell produced another fine run to win M65 bronze, and led his team [Colin Youngson (7th), Stewart McCrae and Hamish Cameron] to silver medals. In Race Two, Ian Stewart (M55) and Andy McLinden (M60) both secured individual silver. Neil Thin (M50), Brian Gardner (M55) and Tony Martin (M60) all finished fifth in their categories. The M55 squad (Stewart, Gardner, Gerry Gaffney and Alastair Dunlop) was second. In Race Three, Kerry-Liam Wilson (M40) and Charlie Thomson both tried extremely hard and achieved 5th places in their age groups. After the races but before the banquet, for some Scots there was a particularly memorable hour, celebrating in the nearby heritage pub The Barton Arms, which was actually hosting a real ale festival at that time. Forres Harriers trio Paul Rogan, Doug Cowie and Colin Youngson, plus Archie Jenkins and (kind abstemious driver) Lynne Marr drank fast. Only one of them consumed slightly more strong ale than was entirely sensible! 2013: Cardiff, Bute Park. The course was flat as a pancake, dry and firm; and the weather calm and quite mild. The amazing Fiona Matheson was first Scot in the women’s race and won the W50 title, for the third year in a row, in emphatic style, as well as leading her team [Hilary McGrath (5th), Beryl Junnier and Pamela McCrossan] to silver medals. A few seconds behind Fiona, Lesley Chisholm ran well to finish 5th W35. Jane Waterhouse excelled to win W60 individual silver, and led her team (Liz Bowers, Hazel Bradley and Linden Nicholson) to second place. Robert Marshall was fourth M65; and Bobby Young also ran well to win individual bronze (M70). Stan Mackenzie (5th M50) was first Scot in the M50-64 race; and Paul Thompson won a fine individual bronze medal (M55). In the 35-49 event, Kerry-Liam Wilson had a good run to be first Scot and 3rd M40. 2014: Nottingham, Wollaton Park. “We assembled in good time on the steps of Wollaton Hall for the photo-shoot. Once again we were blessed with good weather: it was very mild, calm, and almost remained dry. The course was more testing than last year, but was ideal for runners and spectators. In Race One, Megan Wright and Fiona Matheson came up the hill on the first of three laps in good positions, closely followed by Hilary McGrath and Beryl Junnier. Martin McEvilly ROI & Martin Ford ENG were also well up the field. Fiona was being challenged by Clare Elms ENG as the race progressed, and (2nd W50) was just pipped on the line. She was closely followed by Melissa Wylie, who had moved up to 4th W45 and Megan 7th W40. Hilary McGrath (5) and Beryl Junnier (9) helped Fiona to win W50 team silver medals. Meanwhile Isobel Burnett finished 8th W55. Jane Waterhouse was 5th W60, and with support from Liz Bowers (6) and Hazel Bradley (9) won another team silver. Then Betty Gilchrist (1st W70) came through with a commanding lead of 1:37 over Brigid Quinn NI, and in front of all 3 Scottish W65 runners. Alex Sutherland (6) was the first M65 Scot to finish. Bobby Young improved one place on last year to win M70 silver. Pete Cartwright 5th M70 and Gibson Fleming (11) ensured that their team won silver medals. Les Nicol was 3rd M75, and led 80 years young Walter McCaskey (6), and Bill Murray (13) to team bronze medals. In Race Two, Stan MacKenzie finished 8th M50. Paul Thompson and Colin Feechan worked well together to end up 5th and 6th M55. Frank Hurley and Andy McLinden ran very well to secure individual silver and bronze M60 medals. Tony Martin (8) and Doug Cowie ensured M60 team gold for Scotland. In Race Three, Robert Gilroy had a cracking run, finishing 2nd M35. Overall, Scotland won one gold, four silver, and two bronze individual medals; and one gold, three silver and five bronze team medals, our best result since 2011. 2015: Dublin, Santry Demesne. The race was held on almost the same course as previously, but some minor changes were made because of the water-logged conditions. However the team did a lot better than 5 years ago, finishing 3rd Women’s team, 3rd Men’s team and 3rd overall out of the 5 competing countries; and won 4 silver and 8 bronze team medals. There were 4 individual silver medallists & 1 bronze medallist, but unfortunately no gold medals. In Race One, Joasia Zakrzewski finished 3rd W35, behind Anne-Marie McGlynn & Natasha Adams IRL, followed 32sec later by 2nd W50 Fiona Matheson, who was once again pipped in the finishing straight by Claire Elms ENG. With help from Beryl Junnier , Pamela McCrossan and Rhona Anderson, the W50 team won silver medals. Sharon Muir and Alison Dargie were 7th and 8th W40. Betty Gilchrist again finished clear of Brigid Quinn, but was pushed into 2nd place by new W70 Dot Fellows ENG. Isobel Burnett 6th W55, Jane Kerridge 5th W60, Hazel Bradley 4th W65 and Anne Docherty 6th W70 all deserve special mention. Alex Sutherland was first Scots male, finishing 7th M65, 2 sec ahead of 1st M70 Peter Giles ENG. Bob Young and Stewart McCrae finished 5th and 6th M70, and Pete Cartwright made sure that the team was second. George Black put in a brave run, with the aid of permitted painkillers, to finish 2nd M75 just 4 sec behind Peter Covey ENG and 1min ahead of 6th placed Watson Jones. 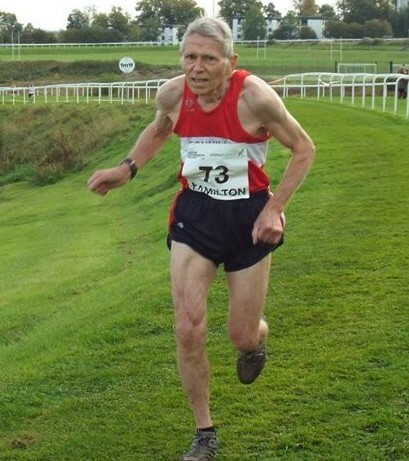 81 year old Walter McCaskey was 8th M75, 2 min behind Watson, ensuring that the M75 plus team won silver. In Race Two, Neil Thin ran extremely well to finish 2nd M55, 23sec behind Tommy Payne IRL. Colin Feechan was 5th M55. Robert McLennan and Paul Thompson also contributed to team silver. Andy McLinden and Alastair Dunlop were 7th and 8th M60. In Race 3 Martin Williams 7th M35 was first Scots finisher, followed by 7th M40, Kenny Campbell. Kerry-Liam Wilson was 7th M45. 2016: Glasgow, Tollcross Park. (Report by David Fairweather). The course had been successfully used for the BMAF Cross Country championship. England’s population advantage always makes them favourites in most races at this event but in certain age groups, with five-year brackets, Ireland and Scotland also secured team golds. In fact this year Scotland produced a particularly good set of results. Three Scottish women’s teams took gold medals with the W35 outfit setting the tone thanks to Gillian Palmer (2), Michelle Sandison (3), Dianne Lauder (4), and Katie White (7). Dianne was actually W40 and an invaluable addition to the W35 team. The other winning women’s teams were at W65 via Ann White (2), Jeanette Craig (3), Hazel Bradley (6) and Beth McLafferty (9); as well as the trio at W70 of Betty Gilchrist (4), Liz Corbett (5) and Anne Docherty (6). By an impressively clear margin, W55 World 10k record holder Fiona Matheson took individual gold in her category (18th overall); and Lesley Chisholm secured bronze in the W40 (9th overall). The competition was intense in the men’s races and five real stalwarts were successful, as Robert Gilroy took a hard-earned bronze at M40 and Neil Thin likewise at M55. 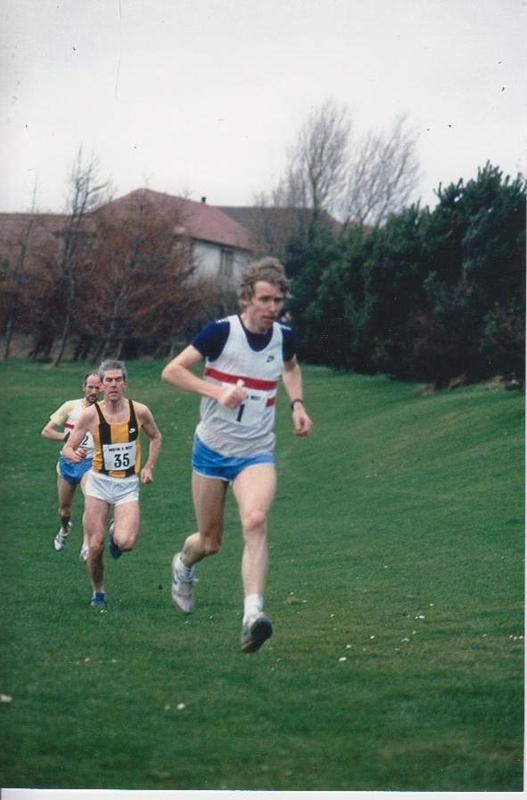 Andy McLinden was a silver medallist at M65 while there was a bronze for Stewart McCrae at M70 and a yet another silver for George Black at M75. Scottish team silver medals included the following. M75: (George Black, Watson Jones 8, Walter McCaskey 10, Jim Scobie 12); M60: (Frank Hurley 4, Paul Thompson 6, Alastair Dunlop 8, Frankie Barton 15). Scottish teams in other age-groups won an impressive total of seven bronze medals. The overall competition ended in a win for England, with Ireland second and the hosts in third – ahead of visitors Wales and Northern Ireland. By means of planes and boats and trains (and buses and hire cars and taxis), Scottish Masters runners arrived eventually in Derry ready to compete in this fixture, which from our winter calendar is surely awarded the ‘Blue Riband’. The weather was cold but pleasant; and the course featured some deep mud, gentle undulations and plenty of mossy, damp grass, which produced strength-sapping racing conditions. Of course, when wearing a Scottish vest, you are meant to run as hard as possible, for your team, country, self-esteem and possibly bragging rights! Our team managers – John Bell, Ada Stewart, Andy and Ishbel Law – were well-organised and always cheerfully motivating and supportive. The new kit looked splendid; and the hotel was an excellent choice. As usual the opposition, from England, Ireland, Northern Ireland and Wales, was formidable but many Scots ran well and we all tried our best on the day. Full results are on the Scottish Veteran Harriers Club website, but here is a summary. Race One was for all the female athletes plus the older guys. Katie White ran wonderfully well to win the W35 race, and was well supported by Michelle Sandison (4th) and Sara Green (11th). Our team finished second, only two points behind Ireland but in front of the Auld Enemy. The W40s also shone, with Lesley Chisholm 6th (in the same time as Carol Parsons 7th) backed up by Ann Robin 12th. Team bronze medals were secured. It was harder for the W45 team, which ended up fourth, led in by Jennifer Forbes (9th). 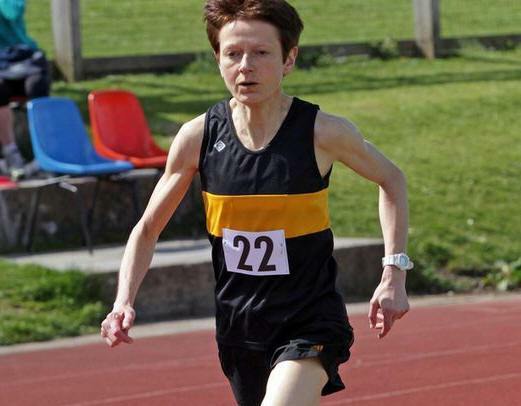 Sue Ridley, who has enjoyed such a long and distinguished running career, claimed that she was still suffering from an injury incurred three years ago. Poor lady, that would explain why she ‘only’ managed to finish 3rd M50, after outsprinting an Irish athlete for bronze! Her team was fourth. Now we come to Scotland’s bright star, Fiona Matheson, who currently graces the W55 category. Her victory was overwhelming – 79 seconds clear of the famous Irish runner Niamh O’Sullivan. Not only that: Fiona also outsprinted the legendary Nick Rose, who won the M65 contest. The Scottish team packed beautifully, with Pamela McCrossan, Yvonne Crilly and Anne Howie 8th, 9th and 10th. Another set of bronze medals was won, after an especially close team race. Scotland was also third in the W60 competition, with Jane Kerridge and Innes Bracegirdle leading the team in 7th and 8th places. Ann White (the mother of Katie, the W35 gold medallist) was equally successful when victorious in the W65 category, 32 seconds clear of England’s well-known Ros Tabor. With Linden Nicholson 7th and Jeanette Craig 8th, our team tied with England on 16 points – but their last counter was 9th so Scotland secured silver medals! Liz Corbett ran very well for 3rd in the W70 race. Her team-mates, Margaret Robertson (8th) and Anne Docherty (9th) also raced strongly to ensure another set of bronze medals. Perhaps our top male team was the M65 outfit, which finished second. However, the English proved impossible to beat, although their winning margin was only three points, due to an excellent silver medal for Tony Martin, and strong backing from Frank Hurley (4th) and Andy McLinden (6th). 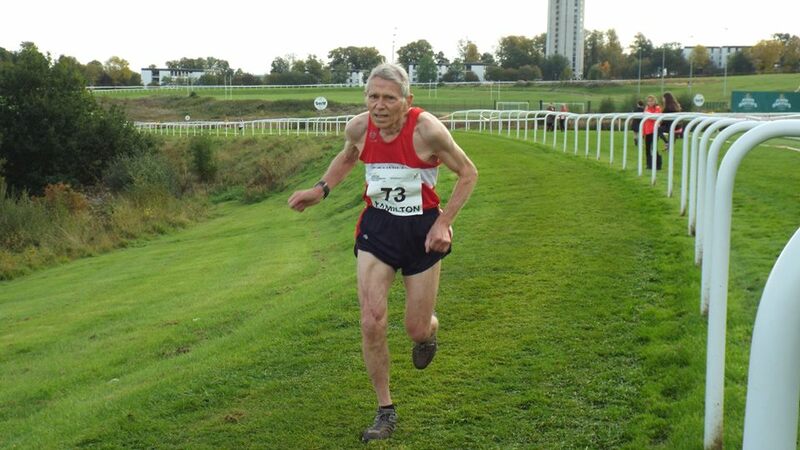 The Scottish over-70s included three runners who were loudly worried, due to leg niggles or illness. Norman Baillie, making his first appearance in a Scottish vest, was the healthy, non-whingeing one, and fought to 5th place. Stewart McCrae (the victim of a heavy cold) still shot off as usual but eventually ran out of steam and was caught half a mile from home by more cautious team-mates, who had started slowly then moved through to 9th place (Colin Youngson) and 10th (Bobby ‘Forever’ Young). This ensured surprise team silver medals. Happily, Stewart recovered quickly and joined the others in a few select Derry pubs that afternoon. The incredible Bobby ran the first of these fixtures in 1988 and has now completed a record total of 26 ex 30. Colin told anyone prepared to listen that, in parkrun terms, he had now run for Scotland in every age group from M25 to M70. In a close battle for bronze medals, our M75 team was squeezed into fourth place. Jim Scobie ran really well to finish 8th. That upbeat character, Ian Leggett (12th) is continuing the longest running career of any current SVHC member, having been a good senior athlete as long ago as 1963. Race Two was for the M50, M55 and M60 categories. Robert Quinn (trade name: Bobby), who has achieved a tremendous amount and remains a top-class runner, only just missed out on an individual medal when he finished fourth M50. Michael McLoone (11th) and Ross McEachern (13th) backed up well but the team were unlucky to lose bronze on countback (by only two places). Our M55s had a tough time but battled bravely nevertheless. 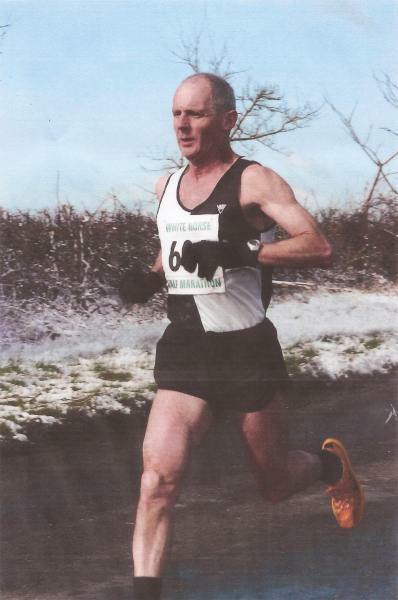 The M60 race produced one real surprise, Although there had been rumours that Teviotdale stalwart Alastair ‘Sammy’ Walker, in his youth a consistently successful runner, was very fit, no one was sure how fast, since he had never actually competed as a veteran! Here, in his very first Masters appearance, he came close to winning gold but was very happy to secure an impressive second place. His team-mates closed in admirably. Paul Thompson (6th) and Alex Chisholm (10th) finished second behind Ireland but in front of England. Race Three featured M35, M40 and M45 age groups. Competition was especially fierce in the events for younger Masters athletes. The M35 men fought hard to fourth team position, with Jozsef Farkas first Scot in 12th place. Iain Reid (first Scot in this race, just in front of Jozsef and Scott Brember) produced a very good performance for 6th M40, as did Leon Johnson in 9th; and the team won well-deserved. bronze medals. Our best M45 runner was Scott Brember in a fine 6th place; and the team finished fourth. The evening banquet was unforgettable, fortunately for good food, drink, social pleasure and well-organised medal presentations; and unfortunately for rambling speeches and an inexplicable lack of result sheets. Nearly all of us enjoyed this trip a great deal, however. The Derry folk were friendly and welcoming and most of the event was very successful, even if no one could actually locate the post-race showers. Roll on Swansea 2018! This year saw our team head for Swansea which, if truth be told, isn’t the easiest of places to reach. As Mens’ team manager, I was just hoping everyone would be all right for race day after such a testing journey. Ross McEachern V50 suggested that I could fly to Bristol then hire a car and drive to Swansea, allowing me to be there early to collect team numbers and check out the course etc. So, when our team arrived finally arrived, slightly battered and bruised, I really didn’t know what to expect come race day but, in fairness to our team, the mood was upbeat, which I must say was better than I would have been after travelling on a bus for some 11 hours. With numbers handed out and our new newbies all kitted up you could see some nerves starting filtering through which. for a team manager, is a good sign, if you ask me. Our team had a real mix of old hands and newbies. Our hotel was only a mile from the course, so some opted to run there and some took the coach to the course, which in hindsight maybe wasn’t the best idea, as the second coachload missed our allocated photo slot time of 10.35 a.m. However, Innes Bracegirdle’s husband Pete took some excellent photos, so many thanks Pete we really appreciated it. On to the real business of the day, the races itself. First up for the males would be our V65, V70 and V75+, who started alongside the young whipper-snapper women of the V35 category. I was hoping that the day would start well and by the end of the race we would have some silverware to get the rest of the age groups fired up. I had high hopes especially of our experienced V75 quartet (Bobby Young, Jim Scobie, Ian Leggett and Pete Cartwright). It was great to have strength in depth for this age group. Our V65 and V70 runners had a wealth of experience at this level and included individual medallists from previous years so medals would depend on who raced well on the day. Under starting orders on a dry course, which seemed to spectators fairly flat, but like a lot of courses it was not until you put the foot down you realised there was always a sting in the tail. The second half of this course was no different, with a long testing drag up to the highest point where you could see positions change throughout the day. First to come over the line for Scotland was none other than Andy McLinden V65 in 8th place, one in front of Tony Martin. Along with Ed Norton, the team secured Bronze medals. With so many runners being in the first race, it is always hard to keep track of positions throughout the age groups, but in-form Alex Sutherland M70 had set his stall out early and was always in contention for an individual award, which he duly delivered with a gutsy performance to claim Bronze. Unfortunately, this age group wouldn’t be claiming any team medals as Norman Baillie had to pull up with a hamstring injury after just 50 metres, taking the team out of contention, although it didn’t deter Stewart McCrae from putting in a sterling performance finishing an excellent 7th M70. If I had been asked beforehand which teams I thought had the best chance of medals, I would have opted for our V60 and V75, both very strong at British level and generally performing well at these events. It was great to see Pete Cartwright toe the line after his recent health issues, despite his doctor advising him not to run (what do doctors know about us runners?). Evergreen Bobby Young M75 never fails to amaze me not only by drinking skills afterwards but especially by his running achievements. He seems to rise the occasion every time with a calculated run making his final surge for victory on the tough climb to claim victory by 20 seconds. First Gold of the day for our men’s team! Jim Scobie, Mister reliable, put in a tough shift, fighting all the way to finish 7th and help us claim a well-deserved team Bronze. Just past mid-day and the medals were starting to come our way. The V60 year age group was up next, and this is where I thought we could play our ace of the pack, Alastair Walker, who I had down as pre-race favourite although nothing is guaranteed in this game such is the competition each year. Alongside the formidable Walker, we had the likes of Paul Thompson, Jeff Farquhar and Alex Chisholm, so hopes were high for a team medal of some colour. Despite being in the sport for a few years more than I care to remember, I still get excited watching guys like Alastair warm up, totally focused on the task ahead. After the first lap Alastair looking relaxed and composed. He was leading the the V60s but not without a spirited effort from the Northern Ireland athlete Laurence Johnston, who was trying to match Alastair’s every move. Jeff Farquhar, now back on the stage where he belongs, ran a great race to finish 7th, Paul Thompson was 8th and Alex Chisholm 9th. These guys were a team manager’s dream. Yet the day belonged to Alastair who was under pressure throughout but stayed calm and extended his lead on the final lap to 32 seconds, which may sound comfortable but my stomach was churning just watching as the NI athlete also ran a cracking race. Second Gold of the day! Not only that but we managed to secure team Silver for our efforts. Our V55 team was made up of Mick McLoone 10th, Dave Eckersley, Steven Worsley and Stan MacKenzie. They had it tough as the strength-in-depth from the other nations was impressive. If I’m being honest, I think this may have been the strongest V55 I’ve seen from England and Northern Ireland, which left Ireland, Wales and ourselves fighting for the scraps, but fight we did, right to the end, with a great effort put in by everyone. Well done lads. V50: This one had me monitor the team performance maybe more than others, as I know most of the team very well and have trained with them on many an occasion. Couple this up with me turning the Big 50 next year – who knows, will I aim for a comeback? (Watch out, Chalmers, your place is on a shaky peg!). Once again England and Northern Ireland were to the fore dictating the proceedings but, from a Scottish point of view, all our team gave us a great race to watch and to see who would come out on top of the V50 Scottish guys. Well that top spot went to Andrew White, finishing in a credible 16th, but as I say a great race to watch as all the guys had a turn at the front at one stage for the Scottish top spot – Andrew White, Stephen Allen, Ross McEachern, Alex Chalmers, Howard Elliott and Ian Johnston. Now we move on to the young guns – V35 to V45. Our trial winner Scott Brember V45 was looking to perform well, as his recent racing programme had shown good signs. Alongside Scott we had Paul Rogan, who made his debut the same day as myself a few years ago down at Birmingham, but was feeling slightly nervous as he had thought he may have overcooked his build up to the race. However, as the results would show, Paul put in a top-class performance. Paul Monaghan had a nasty tumble at the start of the race and never fully recovered to get himself back in to the race where he had hoped he would like to have been, and the result didn’t do him justice, but thankfully at the end of the day it was only his pride that was hurt and nothing more serious. On the injury note, Davie Gardiner pulled a hamstring with only 150 meters to go to which I feel slightly guilty about as I was yelling at him for that last push to the line. Justin Carter and Stephen Allan again showed what the Scottish vest meant to them by putting in 100% on the day – what more could we ask for? So back to Mr Brember, who was tracking his English rival like a man possessed and kept making inroads each lap but maybe just ran out of grass before that Gold would have been his – but hey, who wouldn’t be happy with an excellent Silver medal against a top-class English runner? Great run Scott – he was first Scot home in this race, beating all his younger team-mates – but unfortunately there were no V45 team medals today. V40: As the age group goes down, the pace usually gets faster so to medal at these age groups everyone has to run well and not just well but probably out of their skin even to be just considered for a team medal. So our boys did very well by claiming an excellent team Bronze. Without being disrespectful, I was thinking this would have been a tall order for the boys but I love to be proven wrong, especially when medals are up for grabs. Graeme Murdoch 10th and his team of Donnie MacDonald, Chris Devine, Darran Muir, Malcolm Lang and Stevie Campbell had us all celebrating. This race turned out very similar to the men’s V50 event with each of the guys striving to finish in that counting four. As this result came out of the blue, it was probably the one I will savour the most. As is often said, cross-country races are not won on paper but on the course – guys, sorry for doubting you but at the same time so happy for you all. V35: Please excuse me for starting my V35 report by mentioning the race winner, Mark McKinstry of Northern Ireland, but I couldn’t help but admire the manner in which he took this race by the scruff of the neck right from the gun. Initially I thought he had started far too fast but he just kept going to from strength to strength to claim a well-deserved victory. Our own guys (Grant Baillie 9th, Darrel Hastie, Mike Houston, Chris Mooney, Robbie Paterson and Garry Matthew flew the flag as well as they could but, without making any excuses, the pool our English counterparts have to choose from in this age group is always going to be the toughest, as some of the athletes are still competing for their country as seniors, never mind as veterans. Grant Baillie came away with a top 10 placing which might not sound particularly special but I thought this was a great run. Not to be outdone, all our other guys fought tooth and nail to be part of that counting four and were only separated by a mere 50 seconds. Unfortunately, Garry Matthew had to pull up with one lap to go with a calf injury but, after a few shandies, he seemed on the way to recovery. Now for a brief overview. May I finish by saying that once again it has been a great pleasure, being asked to be team manager for a great bunch of guys who gave nothing less than 100%. Our Scotland team is not made up of any superstars or elitist athletes – just a mere bunch of hairy-arsed Scotsmen willing to give everything they have on the day for the vest! So, roll on next year! Michelle Sandison has written about her splendid individual gold medal in this age-group. Backed by Sara Green and Romy Beard, the team won bronze medals. Carol Parsons finished an excellent fifth, with Jennifer MacLean 9th. Jacqueline Etherington completed the team and secured bronze. Megan Wright (7th) was first Scot home in this category. Karen Kennedy and Allie Chong allowed the team to obtain bronze medals. Mary McCutcheon ran well for 6th place. Her bronze medal-winning team-mates were Sue Ridley (9th) and Rhona Anderson. Our perennial star, Fiona Matheson, delivered individual victory yet again, for the third successive time in this age-group. (Between 2011 and 2013 she achieved the same feat in the W50 category and added two individual silvers in 2014 and 2015!) Fiona was ably backed by all her silver medal-winning team-mates: Anne Howie (7th), Pamela McCrossan (9th) and Mary Western (10th). Team bronze was the result for Isobel Burnett (a fine 5th), Margaret Martin (8th) and Innes Bracegirdle (9th). Last year’s W65 gold medallist, Ann White, won an excellent individual silver this time; and team silver too, with superb backing from Linden Nicholson (4th) and Morna Fleming. Liz Corbett (5th) was the outstanding Scottish runner in this category, and along with Anne Docherty and Margaret Robertson the team obtained bronze medals.